Directors Joel Coen and Ethan Coen are know for their quirky films like O Brother, Where Art Thou and The Big Lebowski and dark dramas like No Country for Old Men. So it's a wonder why their new project about a folk singers in the early 60's New York coffee houses should feel so disconnected. There's nothing likable about their main character and the excellent cast populated in this feature flit in and out of scenes never to be seen again. 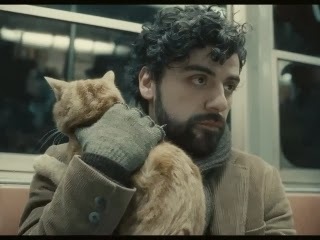 Llewyn Davis (Oscar Isaac) is a sad sack of a folk singer. He's admittingly not a nice guy who taunts his friends, lies, heckles other performers, uses people and sings depressing songs. He once was part of a duo that had put out a record. But his partner threw himself off the George Washington Bridge. As once character says, why not the Brooklyn Bridge? Davis sleeps on one couch to another hauling his guitar from place to place, playing for the pass around baskets in Greenwich Village clubs. At one point he lets out the cat from one crash pad and has to carry it around until the people get home. Of course he loses it. His friends Jim (Justin Timberlake) and Jean (Carey Mulligan) are also performers who had tried to help him out. But Jean is livid at him because she things Davis got her pregnant and reads him the riot act. Davis offers to pay for an abortion. Apparently he's done this before. Davis's record company which is a little old couple in a run down office building have not sold his last recording and don't have any money for him. He hears about this one promoter in Chicago and hitches a ride with Roland Turner (John Goodman), a drugged out jazz musician spouting odd stories from the back seat. The promoter Bud Grossman (F. Murray Abraham) was not encouraging telling him to get back with is old partner. He goes back to New York. This is the week in the life of this one guy. The movie doesn't really go anywhere, just setting up odd situations for Davis as he stumbles through life being his own worst enemy. The best part of the film is the music. They don't cut away for dialogue during the performance and the music is played all the way through. Isaac's voice is powerful and emotional. It shows that although Davis is a loser in his personal life, he's a talented musician. And maybe his luck would change when Dylan hits the folk scene (as briefly hinted at the end) and he gets his life together. The movie has gained some attention by winning the Grand Prix at the Cannes Film Festival and is on may reviewers top 10 lists. Perhaps this reviewer is not as patient.